It all started with my work pants splitting when I put them on in the morning. Not a small split, but one which went down the back of my bum down my leg. 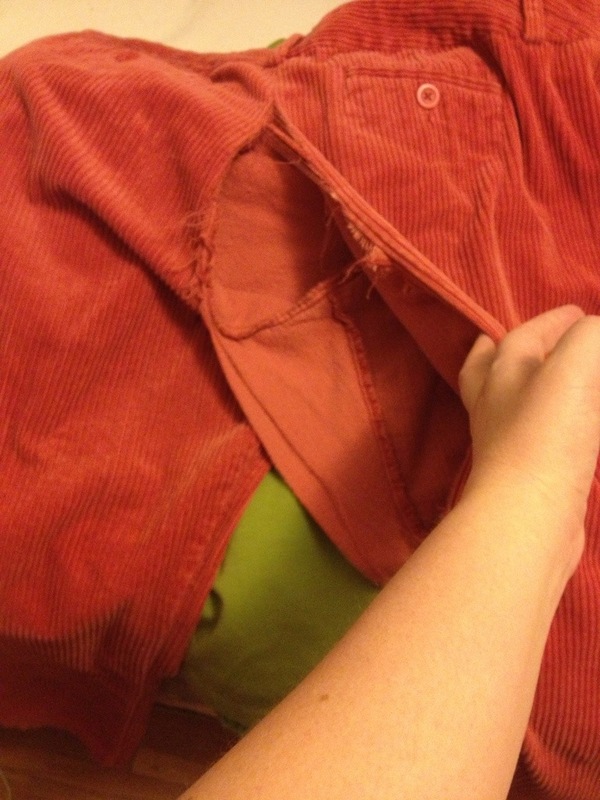 I blame the corduroy, but I was rather upset about it. Had it happened at work, it would have been a major issue. Though this incident did lead to an amazing amount of wonderfully bad puns between Jeremy and I once I sent him the picture, so I can look on the bright side. Then, despite me telling Bug over and over that she must not ever use a round brush on her hair, despite telling her the story of the time my grandmother used a round brush curling iron on my hair and got it stuck in my hair, she chose yesterday morning to not listen. She came to me with one complete side of her hair all rolled up into a round brush. She’d clearly rolled some in, then rolled a little more in, and so on until it was well and truly stuck. I sighed and explained that this very well could mean she’d need a hair cut. But, with a little patience and no small amount of pain on Bug’s part, we did manage to get the hair out of the brush, leaving her with a rather amazing bouffant on one side of her head. We managed to make it to school and work on time. Last evening Bug came home from school smelling like she was wearing perfume. I asked her what it was, and she told me it was a Mary Kay sample she’d received as a thank you for helping a Mary Kay lady while at her dads. Ok fine, but it was pretty strong, and I immediately noticed it made my throat scratchy. I put up with it for a bit, but then had to tell her to please get rid of the clothes she was wearing and take a shower. About the time I started her shower, I noticed something odd at the corner of my right eye. Yep, ocular migraine in progress. Most of the evening was completely shot, since I do get a headache with them, and just generally feel off. I am totally and completely blaming the Mary Kay perfume she was wearing. 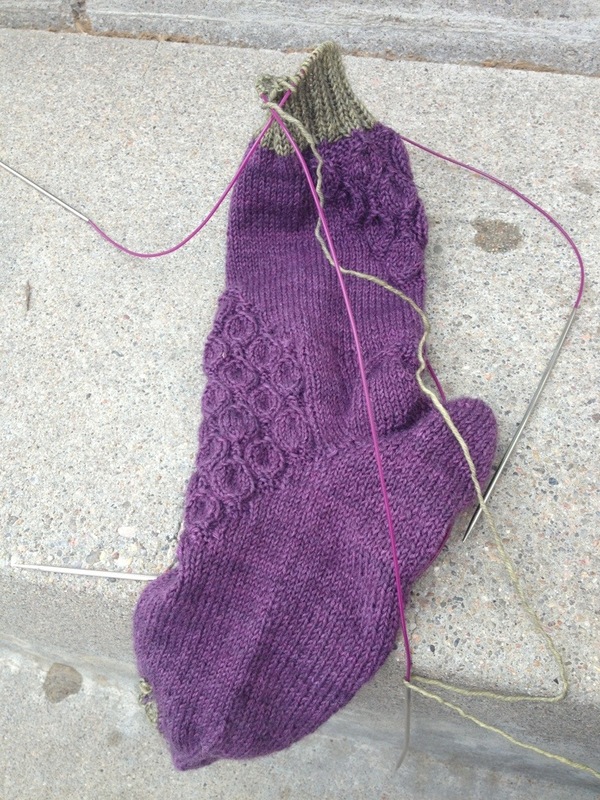 I had hoped to get the leaves of the vintage sock attached and tacked down. It didn’t happen. 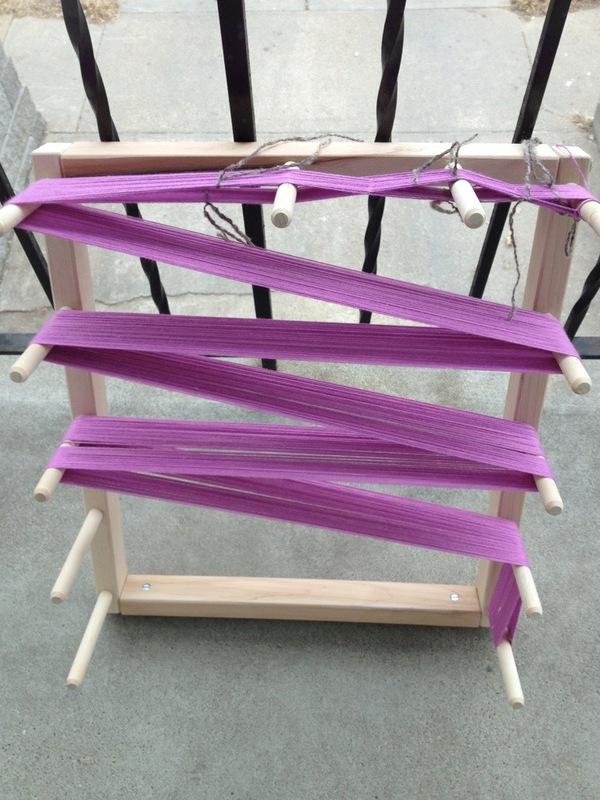 I had hoped to get my loom set up for another go around. That also didn’t happen. 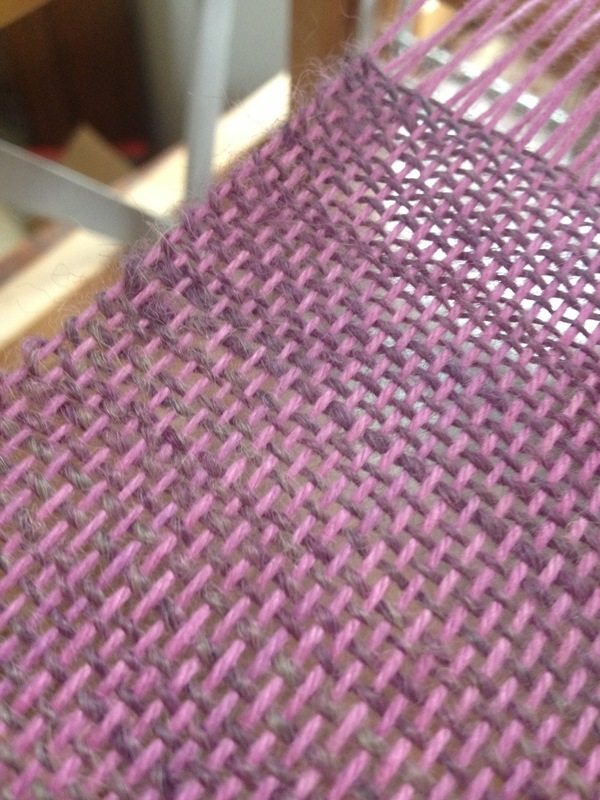 I did manage to get a warp onto the warping board though, with Louet Euroflax originals. Yes, in stash. In fact, assume anything I weave is pulled out of my stash unless I tell you otherwise, since that is THE ENTIRE point to my weaving. It has actually been really good fun to pair yarns in my brain, calculate if I have enough for a warp and a weft, etc. 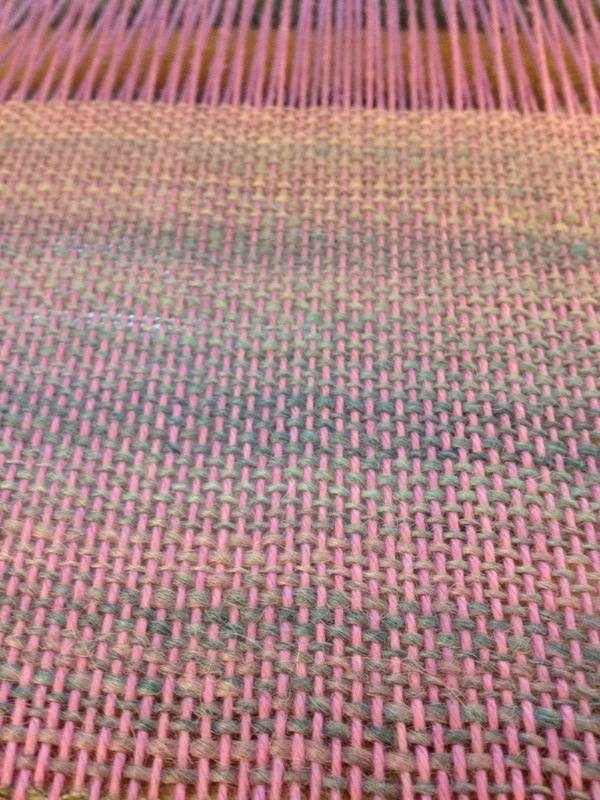 I’d say that has been half the fun of weaving for me so far. I plan to pair this warp with handspun again. I spun this yarn in early 2009. Dyed locks, spun in the grease. They were a pretty interesting experience, I loved the fuzzy yarn, but I couldn’t ever figure out what to do with it. I think the colors involved will compliment nicely with the warp and I am hoping it will leave me with an odd, gently fuzzy scarf. 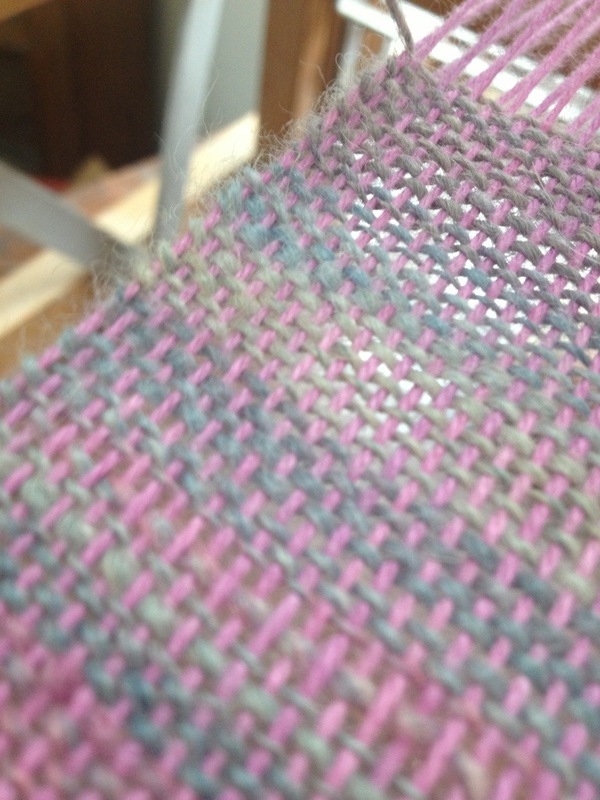 Since I am certainly still in the experimentation stage of weaving, it can’t hurt to try it and see what happens! So here is one more day where I don’t talk about MOS. Much. But, Ummeyusuf has begun a second pair. Apparently short rows is a theme for MOS this year. You know what? 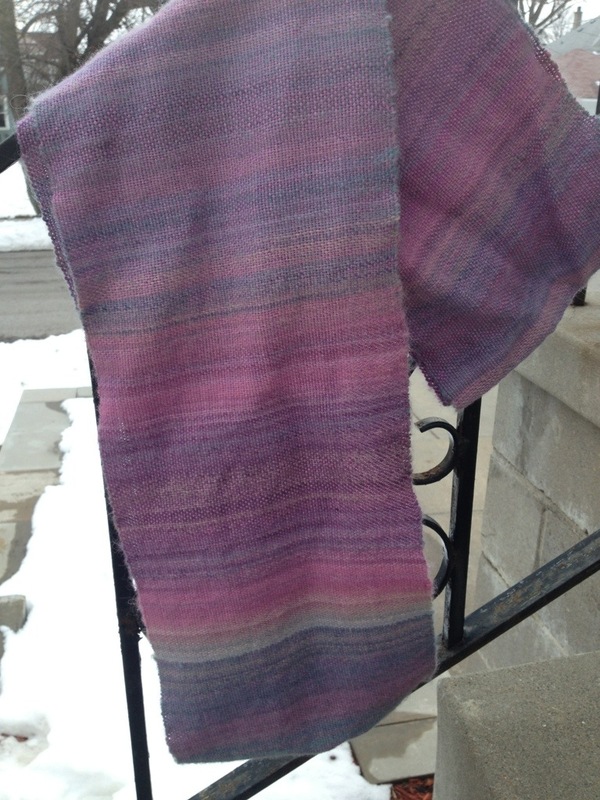 I decided years ago I wanted to weave specifically because of handspun yarn. I just really thought that the look of handspun on a woven piece would be amazing. It may have taken a few years and the cowl is anything but perfect, but I managed to achieve in my first project the look I was dreaming of all those years. The warp and weft pairing are perfect to show off the color changes in handspun and an alpaca fiber labeled “september twilight” becomes just that. A play on the color tones of a september evening sky. And I love it. Absolutely love it. I cannot stop looking at it. Now, how did this scarf become a cowl? Well, let me run you through my thought processes. First, I wanted a scarf. And I love really long scarves, so I decided to plan my warp for a long scarf. But then I got started, and there was a good 6 inches of weaving that was awful. I tore the weft back out and started again. Second try was a bit better, but then all of a sudden something clicked and my edges started looking significantly nicer. It was at that point too late to go back and tear out all that weft, so I kept going. Thank goodness for that extra long scarf. As I worked my way through the project, I got to thinking how much I hated the very beginning and how I would find it not at all acceptable for a scarf and whatever was I to do because the project is just too beautiful to give up on and throw out! I threw out my first handspun way back when, not because it was crazily spun yarn, but because the color of the fiber was hideous and I hated that yarn. I couldn’t do that with this project. But then I remembered that you can sew woven fabric, and why couldn’t I just cut out the section of really bad scarf, then make a french seam at the two ends, making a cowl? That really did satisfy me, knowing that I could probably create something I’d actually wear, and I wove on. In the end, I only had a partial bobbin left of the weft, so I planned fairly well all things considered. The cowl is long and scarf like when doubled over, and the edges aren’t so awful to be totally noticeable. I am still utterly amazed that I made this. I don’t know what my next project will be, but I know now that there will be a next project. And just for fun, I’ll even show you the section I cut out of my cowl. I ask you this, how long will it be before I quit saving waste from the loom? I am having trouble throwing out that yarn, imagining that it would be great stuff to tie skeins of handspun with. But really, that is just crazy talk isn’t it? I am currently 10 ribbing rows away from adding all the crazy leaves to my Vintage Socks. I feel very accomplished to be this far. 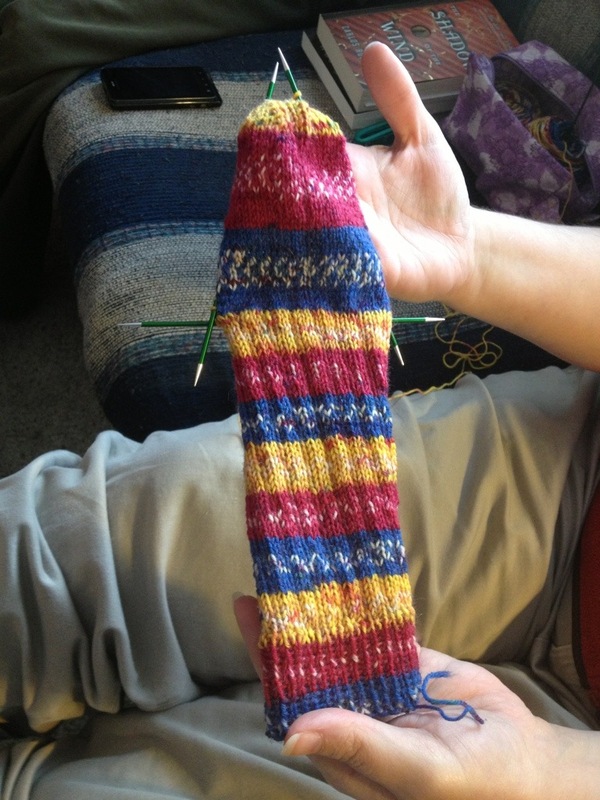 However, I am learning the real reason to my sock knitting aversion lately. My hands ache and I have a nasty case of tennis elbow from sock knitting. These are things which have gotten worse in the last year or so, but taking time off from socks, and knitting in general, has really helped. Now that I am trying socks again, I am remembering the associated pain and realizing that it just isn’t worth it to me. I’ve knit a total of 81 pairs of socks in my knitting career and I do not think it overly important to continue unless I am doing so very slowly and in a pain free way. I may no longer be a “sock knitter.” Which feels like a very strange declarative statement as I’ve been a confirmed sock knitter since 2008. So, with great sadness, I am going to have to let the sock knitting go. I will, of course, finish up these Vintage socks, and maybe have socks on the needles for my mom, knitting them in such a slow manner as to not hurt myself. The rest of my extensive sock stash will have to go toward shawls, scarves, weaving, and other wonderful things. And I may have to destash a few things. 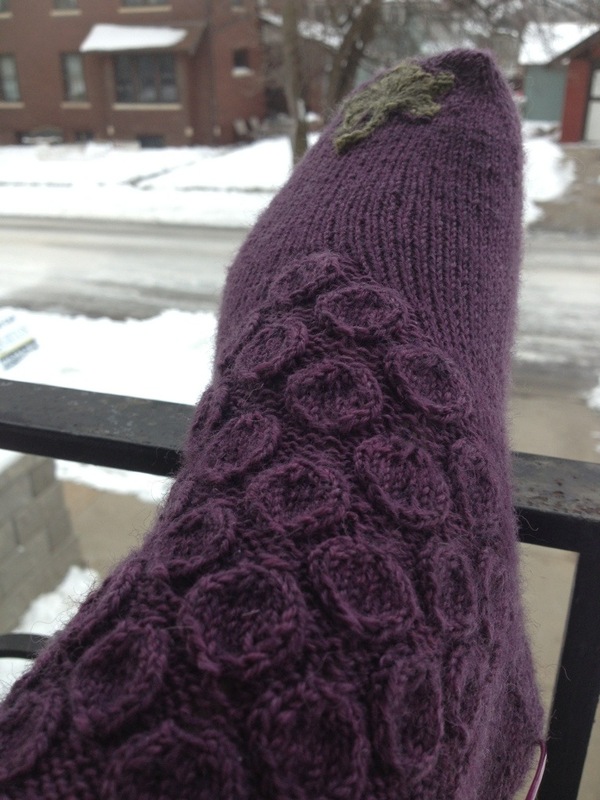 I do, however, have the opportunity to show off a few socks from local gals that do not blog. 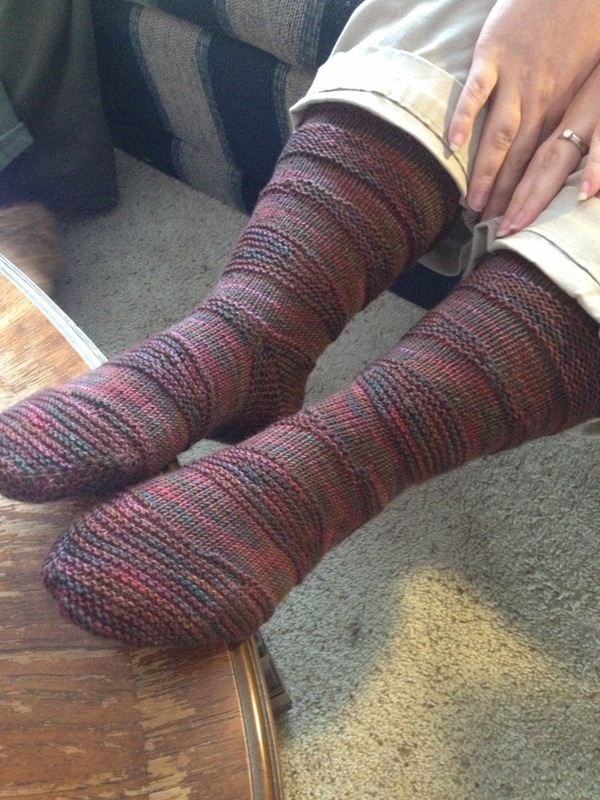 Sarah, who has already completed a pair of socks and a hitchhiker scarf completed her second pair of socks. These are the Wedge socks done in BMFA. 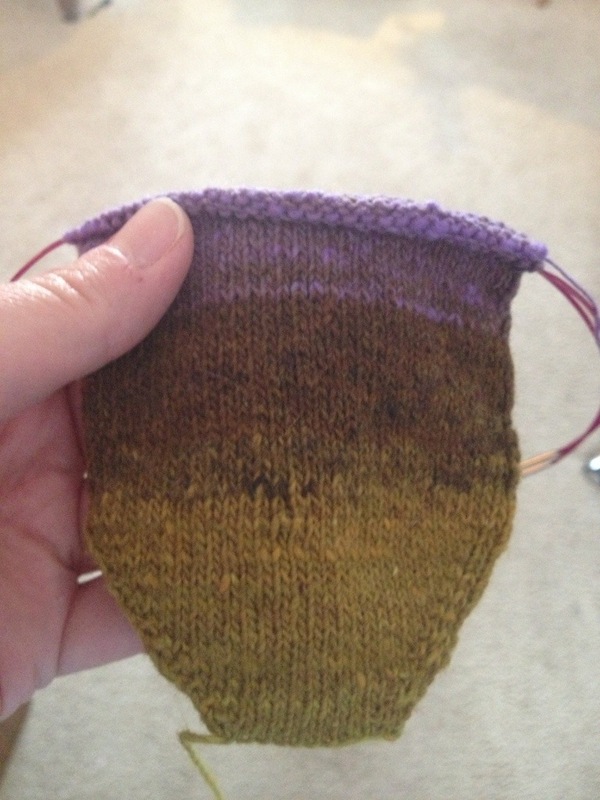 Then she immediately cast on another sock and has already turned the heel. I suspect that her MOS output this year will far exceed any other year she’s participated. Kathy, after a moment of clarity in her sock knitting and then a massive frogging due to it, has now finished her first sock. Also BMFA, so it is not surprising she was blessed with all the flashing of colors on the leg. She’s still not sure how she feels about the fit on these, so she may end up adding to the toe. My experience is that socks stretch considerably, and I always regret not making mine slightly tight. And now we get to see Mary’s sock toe. It is in her absolute favorite yarn, Noro Kureyon Sock. Since it is a discontinued yarn, just about the only place to find it is in Mary’s stash. Because she has purchased all of it. 🙂 She knit this sock toe in Las Vegas, so she totally gets the “Most well traveled sock” award for this MOS. That’s it for MOS at the moment. Tomorrow? I get to show you my woven cowl. First ever weaving project that I am ridiculously proud of even though it isn’t particularly well done. Well, after a few days hiatus, last night I picked up my vintage sock and worked on it until my hand and elbow ached. I am completely done with the embossed grape section on the front, and am now working the beginning of the embossed grapes on the back. I must say, so far these are some of the best fitting socks I’ve ever made. Which is sad, since I am guessing wearing them won’t be a huge priority. As ever, the pattern goes by so amazingly quickly it is difficult to comprehend. While I will probably attempt to finish up my weaving today and do a bit of wheel spinning, I do hope to have the knitting of this sock done this week. 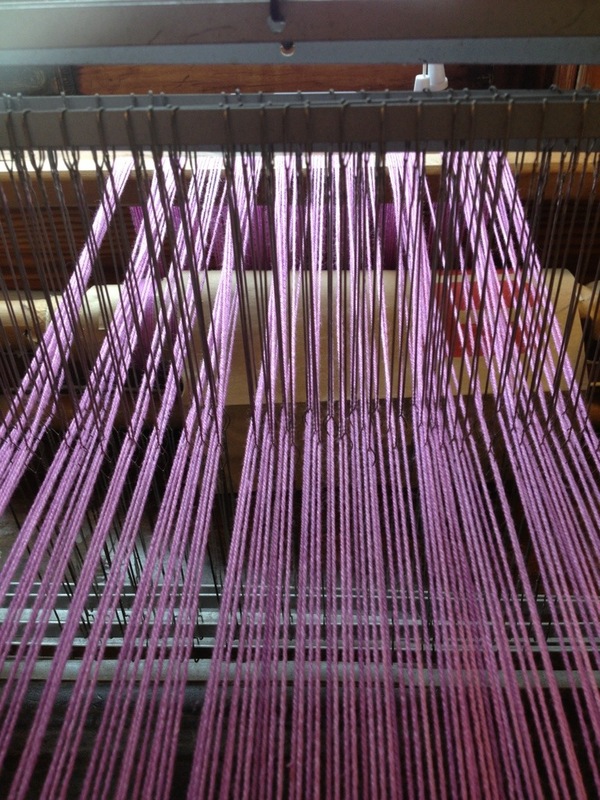 I think one of the huge draws of weaving at the moment is where I have it set up. If I sit there during the day and the day is sunny, the sun streams into that window and it makes me warm and happy. Since we are in the middle of winter, this is quite a balm for my soul. 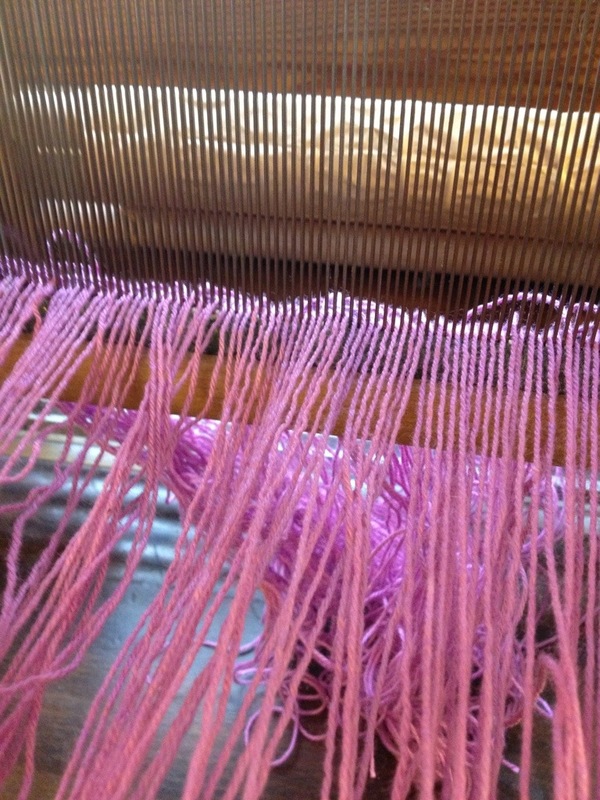 This morning I got up, made a cup of coffee, and sat down at the loom again. Bug decided she wanted to listen to Anne of Avonlea, so this made for a morning of relative quiet, which was soothing. I talked yesterday about my edges. I didn’t like them and was constantly trying to fix them. I think I have, at least as well as can be expected in this project. I also think I’ve learned enough to make significant changes in the next project. I am glad that I made this scarf rather long. While I tried to just use stash stuff that I had no major attachment to, the resulting color combination is so beautiful that I can’t stand not having this scarf work out. So, I do believe once it is done, I’ll end up sewing it into a cowl, just removing the end where the edges are truly awful. I am going to assume it will be long enough for that. All I have for you today is a few edge pictures. This may not be overly interesting to anyone else, but I feel the need to document it. 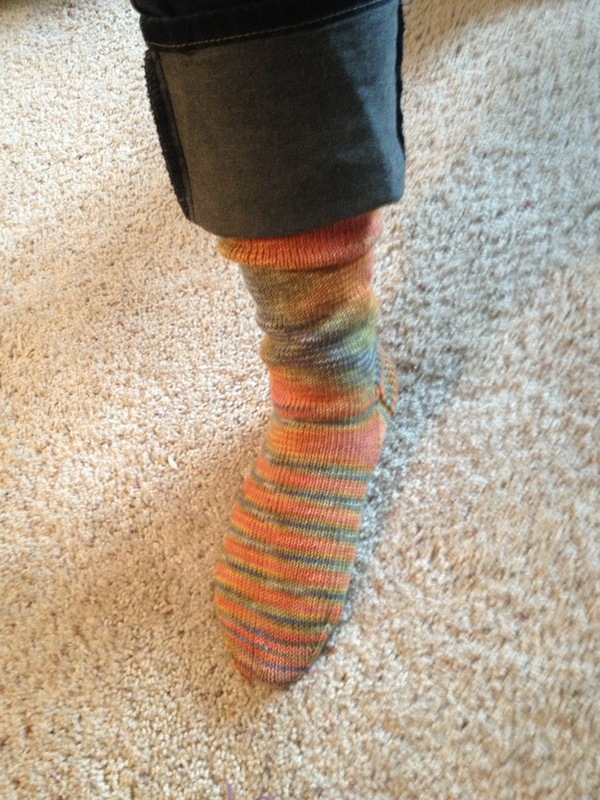 As for Month O’Socks, I’ve not been doing much sock knitting. I did get a few rounds done yesterday on the Vintage socks, and a few rows done on the socks for my mom, but there really isn’t enough of interest to post about. That being said, Ummeyusuf finished her first pair and they are awesome! I love the combination of colorwork with strips. As I mentioned in the previous post, yesterday was a snow day. And as I mentioned, half the fun of a snow day for me is thinking of all the things I could choose to do with an extra day off. While my thoughts did head in the direction of clean out the freezer, do laundry, deep clean the kitchen, etc, they also headed in the direction of crafting. I knew I didn’t feel like knitting a sock all day and my hands were sore and cramping. I am no longer willing to put up with “the claw” that Month O’Socks has given me in the past. I considered working on a few outstanding projects on the knitting machine, seriously considered doing some color blending on the drum carder, but in the end decided what I’d really like to do is try my hand at weaving. A couple years back my aunt gave me a 4 harness table loom. My parents found a way to bring it to me out here on the plane and it has, since then, sat underneath my bed because I just didn’t make purchasing the associated equipment a priority. However, this past Christmas, I asked for those things then proceeded to purchase anything else I had yet to pick up. All I had been waiting for was a good block of time. Time is sometimes very hard to come by. Knowing that the warp would be a learning curve, and knowing that I wanted to finish it in one day, I was waiting for inspiration as well as a day off. And yesterday I had both. When I finally had decided to learn to use my loom, I found on youtube a serious of videos by an Elizabeth Wagner. They are clear, concise, and broken into small enough pieces that they are easy for me to understand. She even spells out the math involved in a way that doesn’t make my brain hurt. I am sure at some point all of these things will become second nature, but for now I decided to just move through the series of videos with her, watching as I performed each task. 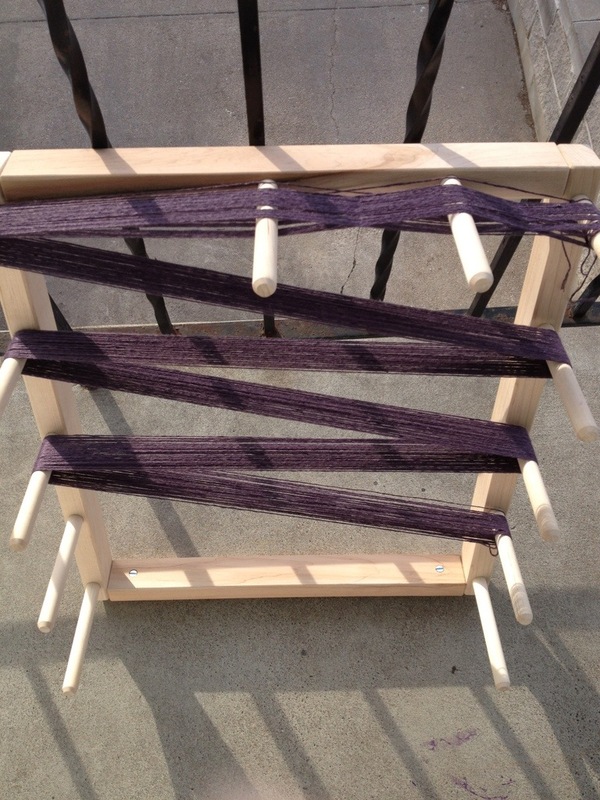 I started with my warping board, adding a cotton/tencel blend I had in my stash. I purchased this from Dyeabolical awhile back but never actually used it. It is a lovely shade of pink, a rich pastel, which is really how I prefer a pastel. My warping board can take 4 yards but I only needed a bit more than 3 so I planned accordingly. At this point I got out my loom, dusted it off, and realized it was a little worse for wear after a plane ride and then being stuck under my bed for a couple years. This was actually a good thing. Why? Because I was forced to figure out why it wasn’t working properly, which helped me investigate the mechanics of it, which ultimately is very valuable for me. I tend to be a person who expects things to just work. And when they don’t, I give up and get frustrated, even though just a bit of time spent investigating the problem would make it so I could figure out the fix. I also have a tendency to assume I am not mechanically minded enough to figure out the problem in the first place. This is really not true, it just takes a little bit of patience on my part. Patience I often don’t think I have. As an aside, if you have not been made aware yet, knitpicks, and crafts americana group had a huge security breech and if you’ve purchased from them your card could be compromised. Do keep an eye out or get a new card just to be safe. I won’t get into my anger and annoyance with a company who has been anything but forthcoming with their information, but suffice it to say I am very sad that I can no longer give my business to a company that I absolutely loved in the past. Ok, back to it, sleying the reed. I did it. The series of videos that I worked with has you work front to back with the warp, so that is how I’ve learned. She then goes on to explain that since I am working from the back of the loom I needed to thread my heddles backward. Since I didn’t want to bother with anything but a plain weave, I just worked 4-3-2-1 and was done. 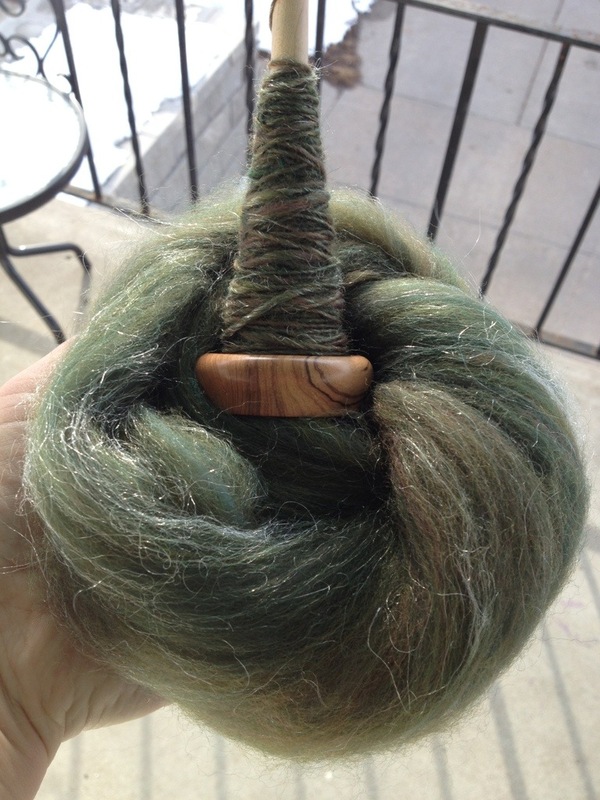 For my weft I chose an alpaca handspun single that has been in my stash since the very beginning of my spinning career. I always loved the colors but it didn’t knit into anything particularly wonderful so I just kept frogging it. 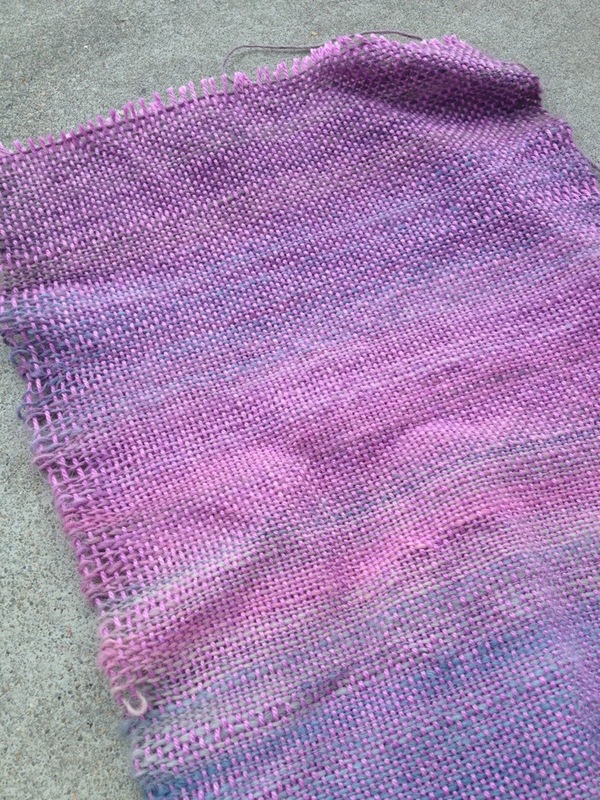 It does, however, match the pink of the warp perfectly. When I decided I wanted to learn to weave, it was in part because of the desire to know what handspun looked like in a woven item. 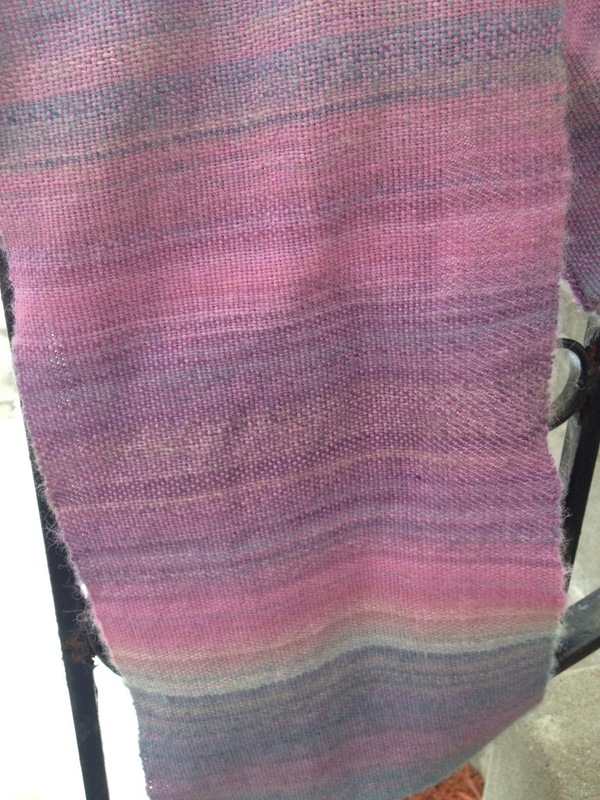 And while I don’t trust myself to use handspun for a warp yet, I couldn’t see any reason not to use it as the weft. However, I used some scrap bulkier handspun samples at the very beginning as waste, and I must say, those looked gorgeous too! I am already eager to figure out all the wonderful combinations I could try. It’s pretty, and I am going to be proud of it no matter how much I hate the right edge. You know, I had no idea that I’d be just as excited about snow days as an adult as I was when I was a child. Now, I remember a time in 2009 when I was just over it, another snow day meant another day of back breaking shoveling onto piles of snow that were well over my head at that point. However, that has not been the experience since. Today is a snow day. And it hasn’t even started snowing yet. Part of me wonders if the storm will be a bust and they were overly cautious, but I suppose since it is supposed to start at noon and make the drive home really ugly, perhaps they were wise. That being said, with 2 more storms right after this predicted, I would probably have preferred to get a day of work in. That being said, I am not one to sleep in, but half the fun of this morning was lounging around in bed thinking of all the things I could get done today. The one thing I probably will not get done is knitting. I need a day off, my hands are sore. While in the past I may have pushed through that soreness, I have too many other little hobbies I could be messing with to do so. And really, I have so little to show you of the Vintage sock since yesterday. I did knit on it, but it felt like I had very little knitting time and I took some time out to do some reading, and consequently there just isn’t much to show for knitting wise. However, I did snap a photo yesterday of a different sock. You see, with the upcoming snow storm I decided I would not be caught without my studded snow tires on my bike again. I don’t know if I’ll get a chance to use them, but I at least want to be prepared to do so. So Bug and I headed over to our favorite bike shop and had them put on. (And no, I can’t do it myself, studded tires are the one tire change I can’t do as the rims are far too stiff and I don’t have the strength for it.) While we were waiting, Bug worked on her homework, studied her math, and drank hot chocolate. 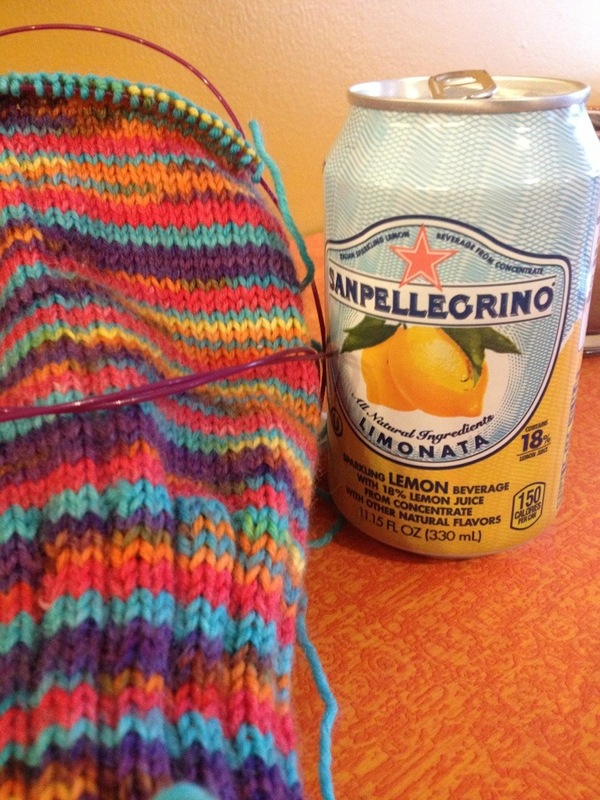 I knit on the sock I have on the needles for mom and had a pellegrino. It was actually quite an enjoyable time.